Hew Donald Joseph Locke (born 13 October 1959) is a British sculptor and contemporary visual artist based in Brixton, London. In 2000 he won a Paul Hamlyn Award and the EASTinternational Award. In 2010 he was shortlisted for the Fourth plinth, Trafalgar Square, London. In 2015 Prince William, Duke of Cambridge dedicated his public sculpture, The Jurors, commissioned to commemorate 800 years since the signing of Magna Carta. He has had several solo exhibitions in the UK and USA, and is regularly included in international exhibitions and Biennales. His works have been acquired by collections such as The Tate gallery, London and The Metropolitan Museum of Art, New York. In 2016 The National Portrait Gallery, London acquired a portrait of Locke by Nicholas Sinclair. 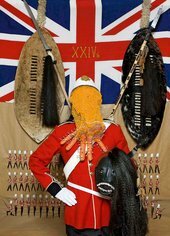 An exhibition, Hew Locke: Here's the Thing, opened at Ikon Gallery, Birmingham, on 8 March 2019, and is due to run until 2 June 2019. It is then scheduled for the Kemper Museum of Contemporary Art, Kansas City (September 2019 – January 2020) and Colby College Museum of Art (February – June 2020). In this evening talk Locke discusses influences such as architecture, popular culture and exoticism.